Now that autumn has fallen, there isn’t a better time to save! How can Liquidation Channel’s Fall into Savings event benefit you? Follow along below and find out! Let us direct you to where you can save on the season’s hottest trends! A recurring trend that often rears its head on the runways, fearless and fierce statement earrings are back again! 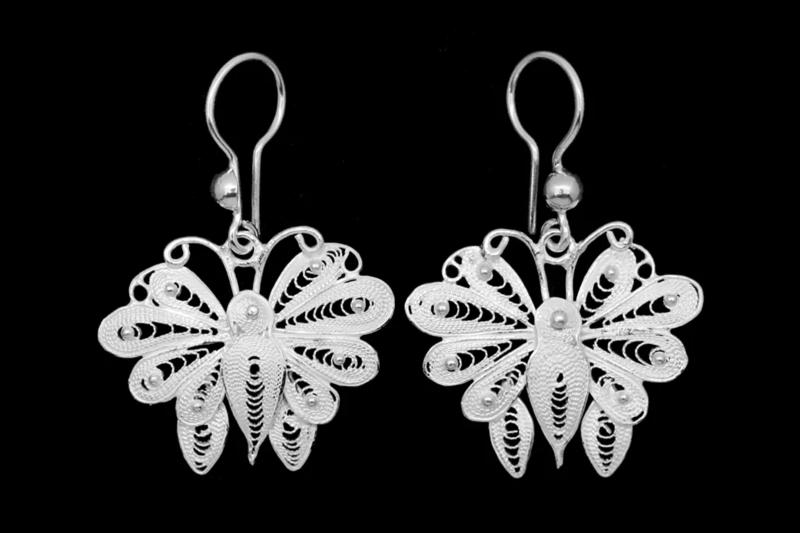 Many designers have been seen sporting incredibly smart and chic earrings in a variety of styles. Celine showcases this trend with innovative shell earrings, while Stella McCartney captivates with bold geometric designs. Check out our selection of statement earrings and get started. Asymmetry has also risen alongside this season’s trend. Fall fashion is seeing more jewelry sporting a single large statement earring in contrast to a smaller stud. Despite this, there’s no need to keep things dull and everyday. With a vast selection of stud earrings available, you can spend hours planning innovative pairings, as you play with this quirky and fun trend. The LC has you covered with these beautiful Floral Statement Earrings! Often considered a spring or summer pattern, floral patterns have hit big this season. Favoring bold prints and deep, neutral colors, floral prints are becoming an unexpected way to make a splash with traditionally neutral autumn wardrobes. If you’re not prepared for this transition, let us come to the rescue! A simple scarf is an ideal way to dip into this trend if you’re curious. A minimal investment lets you rock this style while staying budget friendly. Not only that, but scarves offer a great benefit as you can use it with multiple items of clothing from your wardrobe. Simply put, and easy way to fall into savings. Scarves are a perfect way to transform your look on a budget! Every season, the beautiful people of Pantone publish a color report highlighting the freshest trends seen in the industry. Offering a delightful selection of colors, you can count on seeing them emerge in the season’s selections. If you want a quick and easy way to boost your infallible fall favorites, simply check out our Fall 2016 Gemstone Guide! We pair each color with a carefully curated gem selection from our enormous assortment of rare and exotic stones. Each is a quick and easy way to experiment with these vibrant and exciting color choices. Another spring and summer staple butterflies alight and capture hearts! Top designers can be seen stitching them into their high concept pieces in a number of evocative ways. Thankfully, a healthy selection has always been available at Liquidation Channel. A longtime fan favorite, we’re pleased to see this creature of whimsy acquire the recognition it deserves. Consider butterfly jewelry to add small touches to your daily wear. Or, if you want to make a bigger statement, check out these incredible butterfly print scarves! Either is a fun way to feel light as the weather cools off. The Fall season is all about change, which is exemplified perfectly by the butterfly! Has it ever actually ever gone out of style? Leopard print is back in a big way, not that it ever really went anywhere! Designers and fashionistas are loading up on animal prints, with leopard print anything leading the way! Use this opportunity to show off your wild side, and go nuts as you curate your collection of leopard print accessories. Or, if you want to throw a curve and subtlety buck the trend, consider some chic cheetah print treasures! See who can spot the difference. We won’t tell. Cross our hearts. If you haven’t guessed already, blanket scarves are so large you can use them as a blanket! You might not want to nap on the go, but carrying a warm and snug accessory provides the option to anticipate chilly evenings and nights without needing to lug around a heavy coat. Check out these fun ways to style a blanket scarf! And when you’re done, check out our broad selection of scarfs. With a variety of sizes available, each one is an opportunity to test out your new styling kung fu. Measuring over 7 feet long, a blanket scarf like this truly makes a statement! With our Fall into Savings event, we’ve scoured our stocks to find the very best this season. Equipped with this vital intel, now is the time to go out and make your mark! With such an exciting selection of trendy styles, your LC is the perfect stop to dabble in them all. Now that you’ve seen a smidge of the offerings gracing this season, it’s time to act! Which of these trends are your “must haves?” And which could you leave in the closet? Did we miss an emerging trend that you absolutely adore? Let us know in the comments! Explore our curated selection of fall fashion favorites!